The 2019 Toyota Tundra is proof that full-size pickup trucks can be both rugged and practical as well as stylish. The 2019 Toyota Tundra looks much like the Toyota pickup trucks that drivers around the Columbus area and across the nation have come to know and love. Toyota updated the styling of the 2019 Tundra by adding a modern touch that'll turn heads in every situation. The 2019 Tundra's styling ensures that it works just as well on road as off-road. Of course, style isn't everything. The Toyota Tundra has plenty of substance, as well. There are several exterior features of the Toyota Tundra that help it stand out from the competition. The optional LED headlights light up the road with a brighter and more energy-efficient light than the traditional halogen headlights found in many other full-size pickup trucks. Meanwhile, its optional running boards allow occupants much easier access to the cab of the Toyota Tundra. Full-size pickup trucks are very large vehicles. Without these running boards, it can be hard to access the cab, as it is in many of the other full-size trucks on the road. The Toyota Tundra also has standard 18-inch wheels that are fitted with large and grippy tires as well as stylish optional 20-inch chrome wheels that give the truck an aggressive stance. 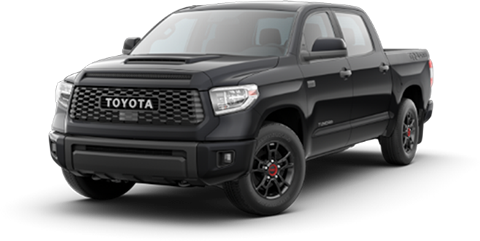 Come to see the stylish and practical 2019 Toyota Tundra at the Rivertown Toyota dealership in Columbus, Georgia. Visit us today for a test drive. 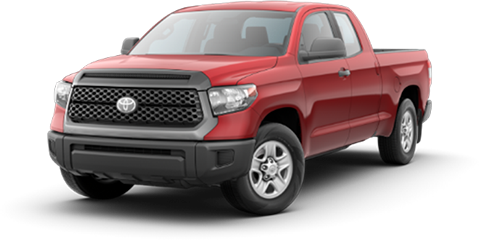 If you're in Auburn-Opelika, AL, LaGrange, GA or elsewhere in the Columbus, GA area, come into Rivertown Toyota today to check out the safe 2019 Tundra. Test-drive yours today. A successful full-size pickup truck needs to have plenty of performance both on the road and off-road. Many competitors of the Toyota Tundra fail in one or both of these areas. The Ford F- 150, for example, equips a V6 engine as standard. The Toyota Tundra has a standard 4.6L V8. This muscular power plant kicks out an impressive 310 horsepower. It is paired with a 6-speed automatic that optimizes fuel efficiency and provides fast gear changes. The standard drivetrain on a Toyota Tundra is rear-wheel-drive. All-wheel-drive is available for enhanced off-road performance. Take the 2019 Toyota Tundra out for a spin at Rivertown Toyota today. The 2019 Toyota Tundra features a rugged and spacious interior to match the tough yet stylish exterior. It can be difficult to strike exactly the right balance between practicality, durability, and style with the interior of full-size pickup trucks. Just look at the unappealing interiors in many of the other pickup trucks on the road, such as the Ford F-150. The interior of the Toyota Tundra, however, is an example of how things can be done the right way. The spacious design can accommodate up to 6 adults comfortably. The standard split-folding rear seats give the Toyota Tundra plenty of interior cargo space to match the abundance of exterior cargo space, which increases the trucks practicality to even higher levels. The optional heavy-duty all- weather flooring and floor mats are easy to clean off and can take a lot of punishment, making them ideal for a work truck. Looking for a rugged and spacious vehicle at a Columbus, GA car dealership? Look no further than the new Toyota Tundra. Drop by Rivertown Toyota today and take your test drive. Toyota is known for equipping their vehicles throughout the lineup with plenty of technology. This is certainly true of the 2019 Toyota Tundra. It comes with a standard Entune™ infotainment system. Nearly all of the full-size pickup trucks on the market offer an advanced infotainment system, but it is an optional extra on many trucks. The Toyota Tundra also has an excellent standard audio system with 6 speakers. Many drivers will want to opt for the available GPS navigation system, which is widely recognized as one of the best GPS systems on the market today. Learn more about the impressive technology available in the 2019 Toyota Tundra by taking a test drive at Rivertown Toyota today.